Roadsides can play an important role in the conservation of both native plants and declining wild and managed pollinator species. In an effort to enhance the success of roadside revegetation projects and create habitat that is favorable for pollinators, the US Department of Agriculture, Forest Service (USFS) and Federal Highway Administration (FHWA) partnered with the Xerces Society for Invertebrate Conservation and Chicago Botanic Garden to release a new DRAFT manual: Roadside Revegetation – An Integrated Approach to Establishing Native Plants and Pollinator Habitat. 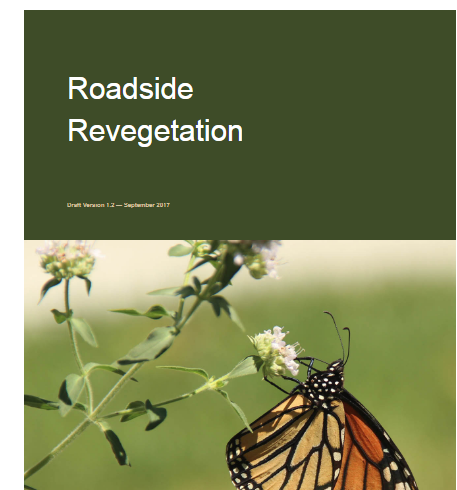 The guide details an integrated roadside revegetation process, providing technical guidance and current best practices for project planning and design through monitoring, implementation, and vegetation management. This update to the original 2007 FHWA/USFS manual contains pollinator-specific guidance as well as new content and an expanded scope to include the entire continental US. The approach and information in the report is broadly applicable to revegetation activities outside the context of roadsides. The report is hosted on the website http://www.nativerevegetation.org along with additional information including a resource library and other training aides. Accompanying these resources is a new online tool – the Ecoregional Revegetation Application (ERA) - a national plant list utility for selecting workhorse and pollinator-friendly plant species within individual US Environmental Protection Agency (EPA) Level III ecoregions. Downloadable data tables contain plant species information such as flowering season, drought tolerance, flower color, pollinators, and commercial availability. USFS provisional seed zones http://www.fs.fed.us/wwetac/threat-map/TRMSeedZoneMapper.php) are incorporated into the ERA as an independent data layer. This powerful utility should aid practitioners in selecting and sourcing appropriate native plant materials for a wide array of revegetation objectives including pollinator conservation and habitat creation along roads, in urban areas, and in wildlands. A final version of the ERA application and roadside revegetation guide is planned for completion in 2018.